Best manicures in Manhattan NYC.Cheap Nail Salons in Manhattan NYC.Manhattan NY cheapest Nail Salons.Cheap manicures in Manhattan NY.Cheap pedicure in NYC.Nail Salons inManhattan. If you want to know which nail salon provides the best manicures and pedicures in Manhattan, NYC, the answer is Dyanna Body and Nail Salon Spa. Voted as the “Best New York Nail Salon” for men and women by Citysearch and other top ranking sites, you would think our services are out of reach for the average New Yorker…but they aren’t. Our prices are wonderfully affordable and our nail salon services are top notch. If you can afford $12.00, our Regular Manicure is the quintessential manicure. This is what you will get for your hard-earned money. Your nails will be filed, shaped and buffed. A warm-water soak is next so that our manicurist can easily cut off dead skin around your nails and push back the cuticles. Your hands are then massaged (yes, you heard right), and then the nail polishing begins. First comes the base coat, then the polish color of your choice, followed by a top coat to seal it all in. And that’s just our basic manicure! It only gets better. The Brazilian Keratin Manicure costs $16.00 and is the perfect manicure if you have dry skin and thin nails. Prior to the manicure, you put on specially lined gloves that work to deeply hydrate and moisturize your hands and strengthen your nails. The before and after is really amazing. The same treatment is available as a 45-minute pedicure for only $28.00. Our $30.00 Spa Manicure with 10 minutes of Reflexology is sheer delight. It begins with a hand reflexology treatment. Reflexology is the ancient practice of applying pressure to specific points of the body to release the energy trapped within them. Our trained esthetician applies gentle pressure to your hands that relieves tension all over your body. The spa manicure follows. Our feet take a lot of pounding from standing, walking around, shoes (especially high heels), and physical exercise. When your feet hurt, your whole body rhythm is disrupted. You owe it to yourself to take good care of your feet. Our day spa is here to help you do just that. The Foot Paraffin Treatment for $12.00 is an excellent choice for rehydrating. First, you get a foot massage. How great is that? Then prior to the pedicure of your choice, our esthetician places your feet in a warm melted wax bath, wraps your feet in plastic film or aluminum foil and then places your feet in our special beauty mittens. This treatment works wonders for dry, callused and cracked feet. For $26.00, our Buff Pedicure for Men is ideal for men on the go. First, we’ll soak your feet in warm water, cleansing them with our special moisturizing soap. Using only sterilized tools, cuticles are pushed back, dead skin removed around them, and calluses are scraped. With tools specifically designed for a natural low gloss look, our nail technician buffs your toenails. Enjoy our 45-minute Sweet Green Tea & Silver Birch Spa Pedicure for $45.00. Our nail technician will soak your feet in green tea extracts filled with anti-oxidants that restore vitamins and minerals to your skin. You will totally relax as you breathe in the birch wood aromas filling the room. An exfoliating scrub, warm towel and hot lotion moisturizer, cuticle treatment, nail filing, and the application of the nail polish color of your choice follows. We offer a large array of mani/pedi services at our New York nail salon, and we are quite certain you will find one that suits your needs and your budget. Call now and schedule an appointment to get the best manicure or pedicure in Manhattan, NYC. Best reflexology foot massage New York.Relax with a reflexology foot massage at Dyanna Spa in NYC. Nothing is quite as relaxing as a foot massage, and Dyanna Spa in N.Y.C. is the best place to experience it. Incorporating the oriental healing art of reflexology massage, our massage therapists focus on targeting specific reflex points on the feet to open up any energy blockages. Our reflexology practitioners utilize ancient Chinese teachings dating back to 2330 B.C.E. As in acupuncture, reflexology divides the human body into several different zones or meridians that exist on both sides of the body. The meridians contain specific points that connect to nerves, organs, and glands of the human body. When the energy (also known as “Qi” or “Chi”) flowing through the meridians is blocked, a variety of ailments, pain, and/or emotional distress can ensue. By massaging and applying pressure to specific points on the feet, energy returns to its natural flow in the body, alleviating pain, illness, and stress. In addition to helping blood and lymph circulation throughout the body, there is evidence that reflexology foot massage can assist with the healing of specific medical conditions. Foot reflexology massage may help those suffering from chronic pain. It can help with some digestive system problems such as diarrhea, ulcers, stomach bloating, irritable bowel syndrome, and colitis. Some research indicates it can help with sleep disorders. A research study showed decreased depression and stress for middle-aged women who received reflexology massages. One study showed it helped with muscular aches and pains as well as with the pain of arthritis and sciatica. It may help not only with blood circulation in general, but it may help improve varicose veins and hemorrhoids. Some report increased memory and better concentration. Other areas of benefit show it may help with migraines and asthma. Manhattan’s Dyanna Spa was named “Best New York Spa for Reflexology and Foot Massage” for two consecutive years in 2009 and in 2010, so you can be assured that you will receive the very best from our experienced and professional N.Y.C. massage therapists. Let your mind and body unwind at our award-winning yet affordable New York City day spa and indulge in our wonderful foot massage treatments for men and women. A thirty-minute treatment costs only $50.00. We guarantee you will leave our spa feeling relaxed and rejuvenated. Look forward to seeing you at Dyanna Body & Nail Spa. Hand and Foot Reflexology Massage in Manhattan NYC.Dyanna Spa in New York City Specializes in Reflexology Massage Treatments. Dyanna Spa and Nail Salon in New York City specializes in reflexology massage and hand and foot reflexology. Our reflexology treatments have many benefits to the mind and body. 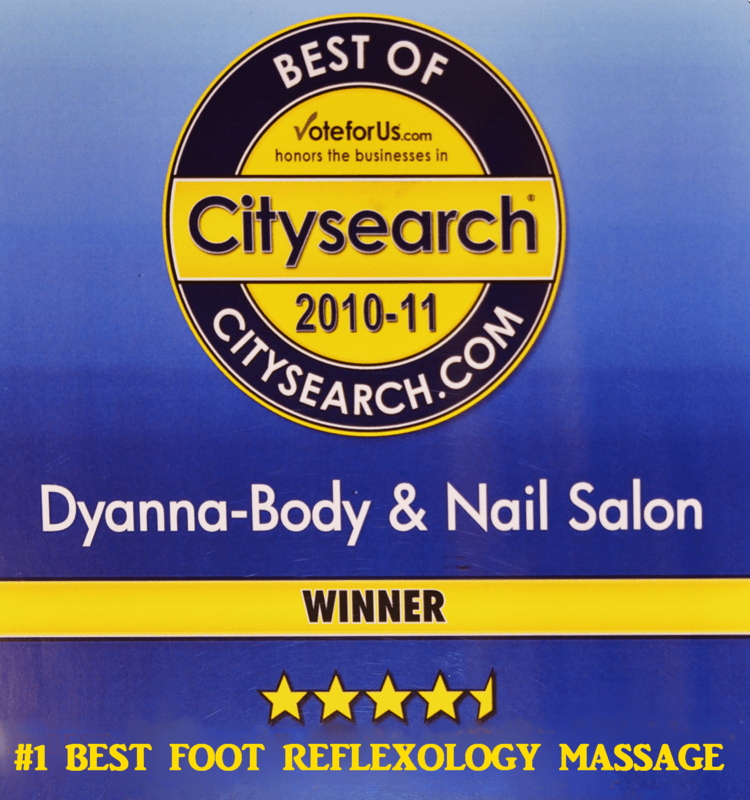 Best New York Spa for Reflexology & Foot massage 2009 – WINNER 2010 by City Search. Reflexology is a method in which pressure and massage is applied using specific hand, finger, and thumb techniques to specific points in the body, usually the hands, feet, and ears. Similar to acupuncture, reflexology practitioners utilize ancient teachings dating back to 2330 BCE, which divide the human body into several different zones. According to reflexology principles, there are zones on both the right and left sides of the body that contain reflex areas. These areas relate to specific organs and glands of the human body. The following reflexology chart shows the different reflex areas of the feet. The idea behind reflexology is that any energy blockage of the body, also known as “Qi” or “Chi”, can cause pain, disease, or emotional distress. By applying pressure points to specific problem areas within the appropriate zones, blockages dissipate, the energy balance of the body is restored, and relief is obtained. What Reflexology Treatments does Dyanna Spa and Nail Salon offer? Our Manhattan day spa offers a Reflexology Massage, which includes hand and foot reflexology treatments for men and women. Our “Spa Manicure with 10 Minutes of Reflexology”, as its name reflects, combines a “Spa Manicure” with a hand reflexology treatment. This manicure cleanses and hydrates your skin and strengthens your nails before applying polish. The hand reflexology massage helps rid your hands and body of built-up stress and stiffness. The “Spa Pedicure with 10 Minutes of Reflexology” works the same magic on your feet as the corresponding manicure and reflexology treatment. Dyanna Spa’s “Reflexology Massage” works on the pressure points of both the hands and feet. It is extremely effective at relieving tension, aches, and pains using techniques such as holds, finger pressure, kneading and rubbing. No matter how good your make-up is applied, or your hair styled, or how impeccably you dress, if you don’t feel your best, you won’t look your best. At our beauty salon, our reflexology massage treatments will relieve pain, reduce stress, and have you feeling full of youthful energy. Effective pressure point hand and foot massage relieves tension, aches, and pains throughout the body. Contact us now to schedule an appointment for your rejuvenating reflexology massage.